Between 1922 and 1924, the young Canadian anthropologist T.F. McIlwraith spent eleven months in the isolated community of Bella Coola, British Columbia, living among the people of the Nuxalk First Nation. During his time there, McIlwraith gained intimate knowledge of the Nuxalk culture and of their struggle to survive in the face of massive depopulation, loss of traditional lands, and the efforts of the Canadian government to ban the potlatch. 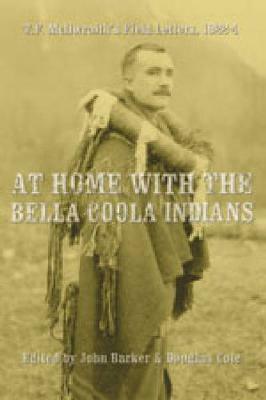 McIlwraith's resulting ethnography, The Bella Coola Indians (1948), is widely considered the finest published study of a Northwest Coast First Nation. This volume is a rich complement to McIlwraith's classic work, incorporating his letters from the field as well as previously unpublished essays on the Nuxalk. Vivid and lively, the letters show the human side of the anthropologist, and provide a fascinating insight into the famous Northwest winter ceremonials and potlatch -- events in which McIlwraith was one of the few white men privileged to participate as a dancer and partner. Extensive editorial annotations and striking photographs make this book a pleasurable read that will appeal to anthropologists and historians, as well as those with interests in Northwest cultures and the history of anthropology in Canada.